Premier Performance Hardwood flooring from Armstrong uses acrylic impregnation and a Permion finish for commercial-grade hardwood durability. The UV-cured urethane finish coating contains crystalline aluminum oxide. 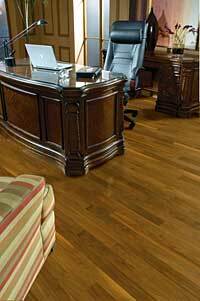 The factory-finished hardwood boards install without additional surface preparation. Hardwood planks range in width from 3 to-5 1/4 inches. Armstrong also injects stain pigments completely through the wear surface of each acrylic impregnated hardwood board. Available in exotic and domestic woods.